For well over a century, academic disciplines have studied human behavior using quantitative information. Until recently, however, the humanities have remained largely immune to the use of data—or vigorously resisted it. Thanks to new developments in computer science and natural language processing, literary scholars have embraced the quantitative study of literary works and have helped make Digital Humanities a rapidly growing field. But these developments raise a fundamental, and as yet unanswered question: what is the meaning of literary quantity? In Enumerations, Andrew Piper answers that question across a variety of domains fundamental to the study of literature. He focuses on the elementary particles of literature, from the role of punctuation in poetry, the matter of plot in novels, the study of topoi, and the behavior of characters, to the nature of fictional language and the shape of a poet’s career. How does quantity affect our understanding of these categories? What happens when we look at 3,388,230 punctuation marks, 1.4 billion words, or 650,000 fictional characters? Does this change how we think about poetry, the novel, fictionality, character, the commonplace, or the writer’s career? In the course of answering such questions, Piper introduces readers to the analytical building blocks of computational text analysis and brings them to bear on fundamental concerns of literary scholarship. This book will be essential reading for anyone interested in Digital Humanities and the future of literary study. "This is the book that literary studies needs. To read Enumerations is to follow the movement of a mind lit up by the new interpretive pathways that computational reading opens, and thus to see demonstrated before one’s eyes its enormous significance. From massive questions like 'What is fiction?' to miniscule matters like 'What details allow us to see two poems as similar?,' Piper uses computational modeling to defamiliarize the act of literary interpretation. One puts down Enumerations with a sense of how rich a field literary studies is, of how many questions we still have to ask, of how much work we have to do. In language that is theoretically sophisticated and technically straightforward—that leaps gracefully from Barthes’s 'non-sentence' to the concept of distributional semantics—Piper finally answers literary scholars’ persistent 'So what?'" "Mathematical reasoning and literary insight dovetail in Enumerations. This beautifully written book uses numbers to make the texture of poetry and fiction surprising, so we can reflect more deeply on habitual pleasures. Piper's readers will come away knowing how to do new things with data, but also with a better understanding of characterization, plot, and the nature of fiction itself. Enumerations is not just an important book but a foundational one for this emerging field." 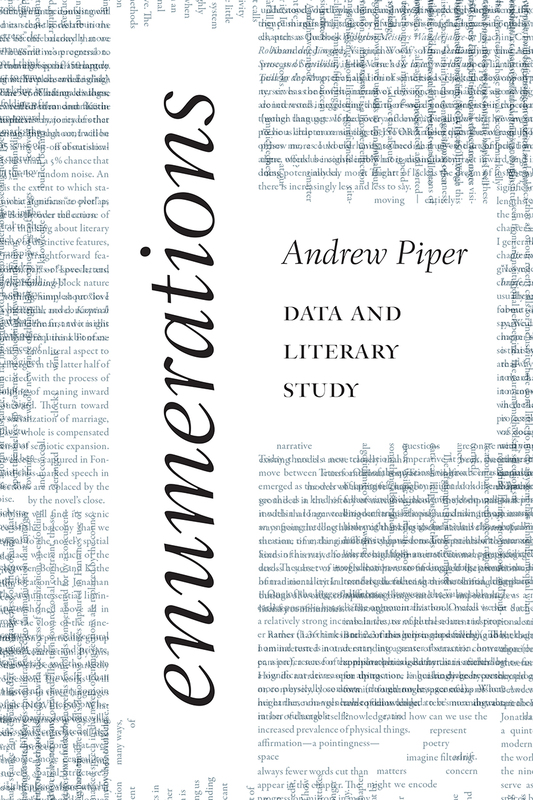 "Andrew Piper’s ambitious and timely book introduces a range of new concepts and approaches into the ongoing debate about the role and implications of computational text analysis for literary studies. In place of the hyperbolic emphasis on size and scale in 'distant reading' he explores the possibilities of repetitive, implicated, distributed, and diagrammatic reading. Uniting these diverse approaches by deploying notions of translation and entanglement, Piper explores the multiple ways in which computational readings always and inevitably participate in the construction of meaning. As well as clearly and incisively describing methods for computational text analysis, Piper uses them to address longstanding questions in literary studies, ranging from nature of poetic contrasts and plot development to the relationship of life, death and aesthetics, and the shape of literary oeuvres. In doing so he foregrounds and advances the traditions and concerns that computational and non-computational literary scholars share in common in a way that bridges and exceeds the differences in method that sometimes threaten to divide them." "Enumerations is a landmark. No book has succeeded half so well in bridging the stubborn divide between numbers and letters in literary study. To his Swiss-army-knife proficiency in data science, book history, and close reading, Piper adds a rare measure of generosity and tact. The book extends itself as an open invitation and encouragement to anyone interested in problems of literary method."